How Much Is a Facebook ‘Share’ Really Worth for Publishers? Photo by chriscorneschi on Flickr and used with Creative Commons license. News orgs have struggled with platforms for a long time. They don’t know how to find a fair working relationship because it’s hard to quantify the benefits for each side. What is the unit of value to ground the negotiation? This has been a particularly slippery question when it comes to Facebook, but it doesn’t have to be. Kaleida CTO Graham Tackley decided it was time to find some answers. What he found confirmed his suspicions that organic shares on Facebook are a reasonable proxy for real web site traffic. The sample data here is pretty small, but it’s enough to get started. It includes one day of data from a publisher we work with who will remain anonymous. We have total page views and referral data for hundreds of articles published in early April, 2017 by “Publisher X”. 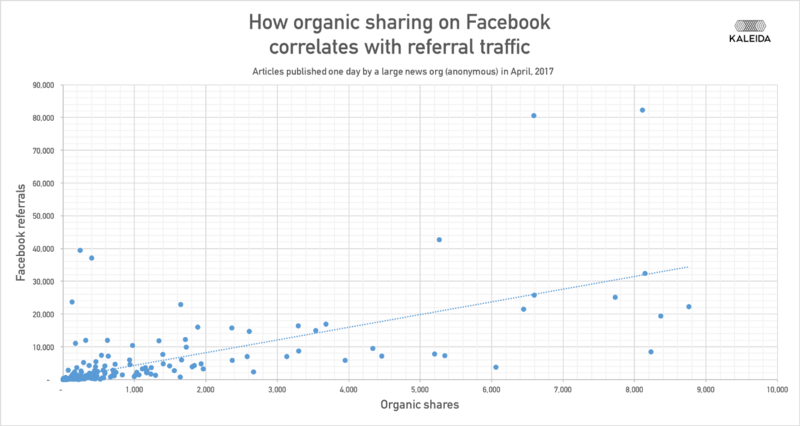 In this chart you can see a band of dots suggesting a correlation between organic sharing and Facebook referral traffic. The Pearson correlation coefficient is 0.86. To put that in context, a perfect correlation is 1.0, meaning every point is an exact 1-to-1 relationship between the x and the y axis. A correlation of 0.0 means there is no relationship, that the figures are all totally random. So, a correlation of 0.86 is actually pretty strong, good enough to confirm the idea that Facebook sharing patterns are a reasonable proxy for Facebook referral traffic patterns on a web site. The correlation between organic sharing and total web site traffic is much lower at 0.65. Facebook is not the sole source of traffic, of course. But neither is Google which scores 0.89. Google scores higher overall because Google provides a more even spread of traffic to publishers’ web sites, driving people to home pages and the like in addition to articles. 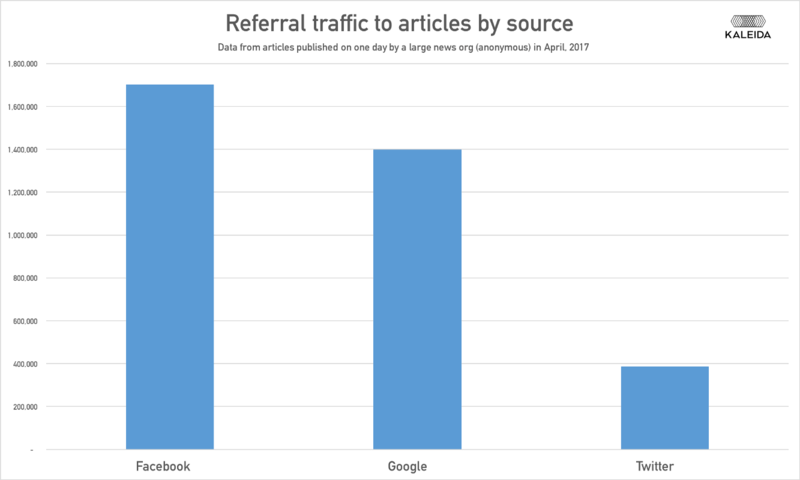 Interestingly, while Google traffic may be more reliable and evenly spread Facebook pushed more referrals to article pages for Publisher X than Google did. So, if there’s a strong correlation between sharing and traffic then we can work out how much value Facebook adds to the bottom line. Crucially, we can trust that the number will convert into real income unlike some of the things Facebook wants publishers to do. What is a ‘share’ on Facebook worth? This data can help us paint that picture. First, let’s improve the precision of the answer by focusing on the higher value data. We know, for example, that most articles get very few shares, less than 100. Let’s throw those out of this sample, because those shares aren’t really helping either the publisher or Facebook. Equally, the 90th percentile have gone viral or they got a huge boost in some unpredictable way. Facebook can’t guarantee those will happen. According to Kurt Gessler of Chicago Tribune, the algorithm may not surface a third of all brand page posts anyhow. So, let’s throw those out, too. That leaves us with articles that have earned between 80 and 10,000 organic shares. Publisher X here had 1.1M Facebook referrals for that sample from over 240K shares. So, in this case, one share on Facebook counts for about 4.5 page views. If we use a generous average eCPM of $10 to make the math easier then it’s reasonable to say Facebook referrals have driven about $10k worth of advertising revenue opportunity that day for Publisher X. Revenue divided by transactions = unit value. 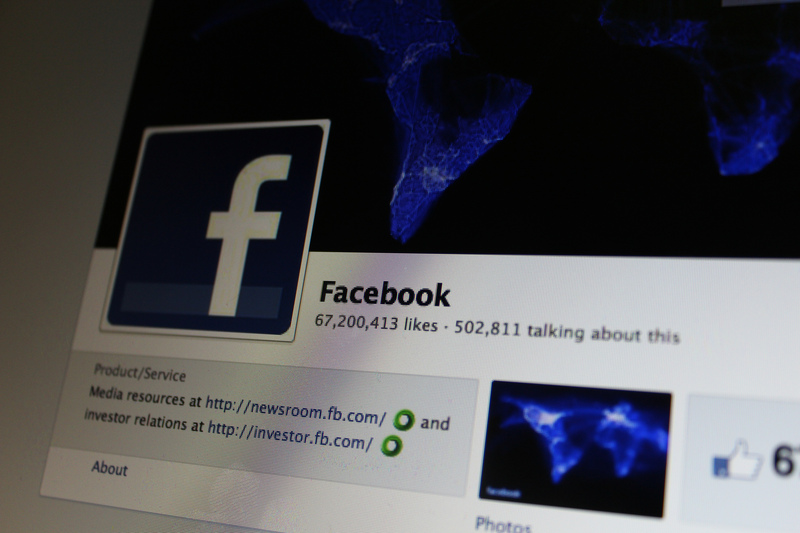 So, how much is a share on Facebook worth? If that was a typical day for this publisher and all the other assumptions are in the right ballpark then Facebook referrals probably drive between 3% and 5% of total digital revenues for Publisher X.
It’s true that being present on a platform has value to it far beyond referral traffic. It’s also true that publishers could be wiser about their publishing strategies which would improve that figure. But to accept the sales pitch from the platforms without also knowing where the tangible value lies and how much is on the table is a mistake nobody should make. Strategic value is really important, but given the internal cost of many publishers’ Facebook initiatives, including Publisher X, it’s likely that much of the strategic value in partnering is being lost. And as digital ad revenue market share moves away from news orgs this trade off feels less and less compelling. Now that we know sharing and referral traffic have a significant and reliable relationship those discussions should feel different. Negotiating that partnership should start with a number: $0.04. Matt McAlister is co-founder and CEO of Kaleida, which measures the flow of information around the world by analyzing the output of news publishers and the sharing habits of consumers and forming insights into what matters most, to whom, when and how much. He has been deeply involved in journalism and media tech since 1994, leading digital business at print publications (IDG’s InfoWorld and The Industry Standard), developing APIs and open data initiatives at larger media companies (Yahoo! and The Guardian), and starting new companies. He is also cofounder of Publish.org, a nonprofit for open journalism. Contact [email protected].